Charles Moore Finally Gets Broadband! In everyone's life, there are dates that particularly stand out as milestones. There are the obvious ones of course: one's birthday, birthdays of children and other loved ones, wedding anniversaries, and, on a more somber note, the days that people close to you pass away, which become disconcertingly more frequent as you morph into middle-age. On specifically personal level, a big one for me was September 29, 1967, when I took and passed my driver's test on the first day that the Department of Highways examiner's circuit reached our small village, six days after I turned 16. I had of course . . . ahem . . . done a bit of driving prior to reaching a legal age, but that's a another movie, as they say. There was the day my first Mac arrived sometime in early December 1992. I don't remember the exact date, being sick in bed with the flu at the time, but the Mac helped cheer me up. 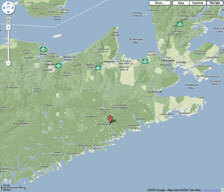 Moore lives in rural Nova Scotia. Another major milestone was passed on October 31, 1997, the first day dialup Internet service reached our neck of the (literal) woods. The Web opened up a whole new world and profoundly changed the dynamics of my work as a freelance journalist. What I didn't anticipate - indeed didn't even consider of the time - was that it would be nearly a dozen years before the level of Internet service here improved beyond that 26,400 bps data throughput I was getting my very first day in 1997. Fast forward: September 10, 2009 will go down as yet another major red letter-day in my life - the day I finally got broadband Internet in my home and office, which are housed in the same edifice. Three years ago, the Nova Scotia government, with the help of some funding from the feds, pledged to have broadband availability in every part of the province by December 2009 for the one-fifth of homes and businesses for which there was no access. With us, they didn't beat the arbitrary deadline by much, but it's finally here - and certainly making radical difference for me already. It's actually quite an adjustment. No longer am I obliged to make sure no one else needs to use the telephone before logging on, and people can actually get through when they want to phone us, since our single land line connection has been our sole umbilical to the outside world. I certainly don't want to badmouth the dialup service we depended on for the past twelve years. It has been extremely reliable, with only one half-day of downtime that I can recall, which was caused by a Department of Highways weed whacker accidentally severing the main fiber optics cable that connects this isolated rural district to the outside world. However, dialup has been increasingly frustrating as Internet content became more bandwidth greedy and Web developers started taking it for granted that their audience would be equipped with high-speed access. That is actually far from reality for a lot of folks yet around the globe and has created essentially two classes of Internet citizenry. Our new broadband service is wireless, with a dipole RF antenna mounted on the roof and aimed at a transmission tower located about three miles away. There were some tense moments when the installers arrived last Thursday. 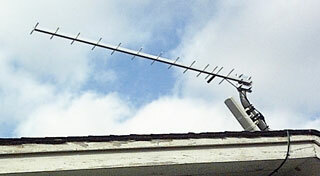 They at first experienced some difficulty picking up a usable signal at ground level. We live in hilly terrain, and there is a stand of tall trees immediately to the northwest of us, which happens to be the vector to the transmission antenna. However, a ladder trip to the roof succeeded in picking up a usable signal, so we were good to go. 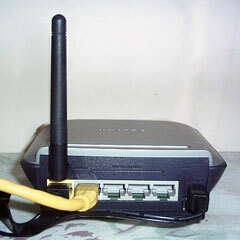 I had purchased a Belkin Wireless G router the previous week in anticipation of the installation appointment, so we were able to plug the wireless modem connector into that. After the long wait and buildup, the reality was almost anticlimactic. I just turned AirPort on in my G4 PowerBook and was online, surfing at exponentially faster speeds than I'd ever experienced at home. It works just fine with the PowerBook and my Unibody MacBook, both of which have built-in AirPort, and the Buffalo WiFi card in my workaday Pismo picks it up nicely too. The Belkin router, which is truly plug and play, has an advertised wireless coverage range of up to 400 feet, so we have tetherless Internet anywhere in - or for that matter around - the yard outside the house with the laptops. I will have to pick up another CardBus WiFi card for my wife's Pismo, but we are going to remain dialup subscribers, downgraded to the most basic and cheapest level of service, at least until we gauge how reliable this wireless service is going to be, so she's still using dialup for email. However, so far having broadband after such a long stretch of pent-up frustration is delightful - almost intoxicating. I've been on high-speed Internet enough elsewhere to know what I've been missing, but having it available any time I like seems almost too good to be true. A concrete example: On Thursday evening I downloaded the latest update of Firefox 3.5 - a roughly 17 MB download that would have taken about 2.5 hours with our sluggish dialup. I set the download, went downstairs to get a cup of tea, and by the time I got back it was done. I am now getting used to restructuring my workflow habits to take advantage of the speed. Over the past dozen years, I had developed an intricately choreographed multitasking system whereby I tried to keep the sliver of bandwidth available over our rural copper phone lines and antiquated analog switching equipment as efficiently utilized as possible, having Web pages downloading or stuff uploading or email sending in the background while I did other things - or too-often just waited. I figure having broadband will eventually slash at least a couple of hours off a typical workday, maybe more. However, it's weird to have so much of my work routine mode rendered simply obsolete in one fell swoop. Welcome, but weird. Somewhat more expensive too, of course - a smidge over Can$50 a month with tax on a two-year contract plus another fifty bucks for the installation, which is almost twice as much as the Can$25 + tax we've been paying for dialup, but a lot cheaper than the only other broadband alternative available here - Satellite Internet. In Nova Scotia, folks with access to DSL or cable Internet service are paying about Can$30 a month, so it's not quite the "competitive" rate that was initially promised, but I'm not complaining - not too loudly anyway. Actually, it's just great, and the privilege of living and working in a spot like this more than mitigates the higher cost of broadband. I'm just thankful that finally we have broadband!